Felipe Martins graduated as an Architect and Urban Planner from the Catholic University of Minas Gerais (PUC-MG) in 2006 and as a Product Designer from the State University of Minas Gerais (UEMG) in 2010. His professional goal is to utilize his passion and the experience acquired thus far in his career to the fields of architecture and design. He plans to do this by constantly searching for new innovations regarding projects, product design, and space. 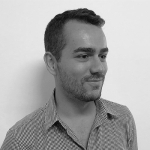 Felipe works as a Project Manager and Designer at the WSDG Brasil office.